For Christmas this year, my sister requested red fingerless gloves. She has discovered the joys texting and wants to be able to do it in cold weather without completely exposing her hands. I knew I had a generic glove pattern in my Ann Budd pattern book, but I wanted to add a textured or a cable design to it. 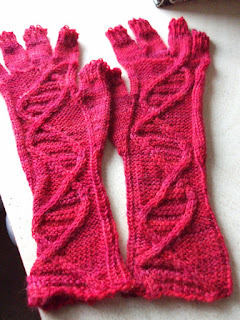 So I began digging through a folder of old knitting patterns I've torn out of magazines or printed off the internet over the years and I ran across the June Oshiro double helix cable pattern. I had used this cable years ago to make a pillow, and I thought it would be perfect for my sister's gloves, since she's a fellow science geek. Anyway, here are the finished gloves. I'm really happy with how they turned out. They were fun and easy to knit, and the cable pattern fit perfectly with the number of stitches I needed, so I didn't have to do any fancy math to get it to fit. The yarn is a Knit Picks sock yarn (I can't find the ball band, so I can't tell you exactly which one). It's a wool/nylon blend, so my sister can machine was them. I knew she wouldn't want anything that has to be handled with care. I have a couple more Christmas gifts to knit. Pictures will be posted when they're done. Happy holidays! They turned out great! I got some of that thread you can sew onto gloves/mittens so that people can text while wearing gloves. Of course I haven't used any of it yet. :) Maybe later this month. Thanks, Monica! I've heard about that thread but haven't tried it. If you use it, I want to hear how it works out. I'm very intrigued.